In previous blogs, different versions of SAP Transportation Management (TM) were analysed. S/4 HANA Supply Chain for TM (embedded TM) is the future of TMS (Transportation Management Systems) for SAP. LE-TRA (Logistics Execution -Transportation) and Business Suite for SAP TM (standalone TM) will be phased out soon. Basic shipping process, which was earlier designed through LE-TRA, should be realized via basic shipping functionality of embedded TM. Since professional shipping requires additional license cost, customers usually would like to understand the additional business processes in transportation, that can be designed using professional shipping functionality of embedded TM. Next few blogs will be detailing few business problems/issues in transportation process and its resolution/design using SAP TM. Shippers are usually in the business of designing and manufacturing the product and may not have enough resources and expertise in transportation of these products to customers. Hence, the shippers generally sub-contract most of the transportation to external carriers. To have a sustainable and stable transportation process, shippers usually have agreements with the carriers. They regularly negotiate the terms and rates with carriers and update the agreements as per the requirement. Once the carrier completes a shipment, an invoice will be sent by the carrier to the shipper for payment of transportation services. The value in the invoice is verified against the calculated amount (based on the agreement), and the payment is processed. In case there is any variation between the calculated amount and the carrier invoice amount, a dispute process will be initiated. This entire process is called freight settlement process. There are other variations of this basic process such as Electronic Receipt Settlement (ERS) etc…. To facilitate freight settlement process, in SAP TM, freight agreements are used to store the carrier contracts. Versioning is also available to update the freight agreements. During the shipment process, a freight order is created in the TM system and the carrier is selected based on business rules. After charge calculation based on freight agreements, the freight settlement document (FSD) is created. Basic process for freight settlement as mentioned above can be achieved through basic shipping functionality of embedded TM. (A similar process was available in the LE-TRA via shipment cost document, in which the rates are stored in condition records). In carrier contract (Freight Agreement), usually there are different charge types to categorize various charges. For example, charge types can be ‘Line Haul Charges’, ‘Fuel Surcharges’, ‘Discount’ etc… Most of these charge types will be constant and will be required for all scenarios. However, there is a possibility to have event-based charges. These charges are applied only if a certain event has occurred. Else, these amounts will not be charged by carriers. For example, a cleaning event. In case, during the transportation of products, if there is a leak from products due to poor packaging by the shipper, then the truck or container must be cleaned. Carrier may charge this additional amount in the invoice. So, if such events occur, then carrier will charge an additional amount. If this is not incorporated in the TM charge calculation/FSD, then there will be difference in the amount in TM FO/FSD and Carrier Invoice. This can lead to a dispute, which can further get into a dispute resolution process. Dispute resolution can be a strenuous and time-consuming process for both carrier and shipper. Hence, there is a common business requirement to detect the events and calculate the charges automatically. Else, these charges have to be added manually in the respective freight orders. Charges based on expected and actual events: In this scenario, based on planning, an event (for example departure) is expected to happen on a certain date/time. If the actual event happens after a specified grace period, then the penalty amount is charged by the carrier for the additional waiting time. TM can automatically detect the charge applicability based on the timing of the actual event posted. Based on the expected event date, reported event date and the grace period, the charge is applied on freight order. SAP has provided a standard calculation bases – DELAY_TOT & GRACE_DAYS. The charge type, created using these calculation bases, can use rate table with the delay duration for various combinations. Currently the delay is calculated in days and in case we require hours or minutes in the rate tables, then the helper assignment in these calculation bases (/SCMTMS/CL_TCC_CB_DELAY & SCMTMS/CL_TCC_CB_REL_CBASE) have to be modified. This scenario/requirement is predominantly for delay/demurrage charges. 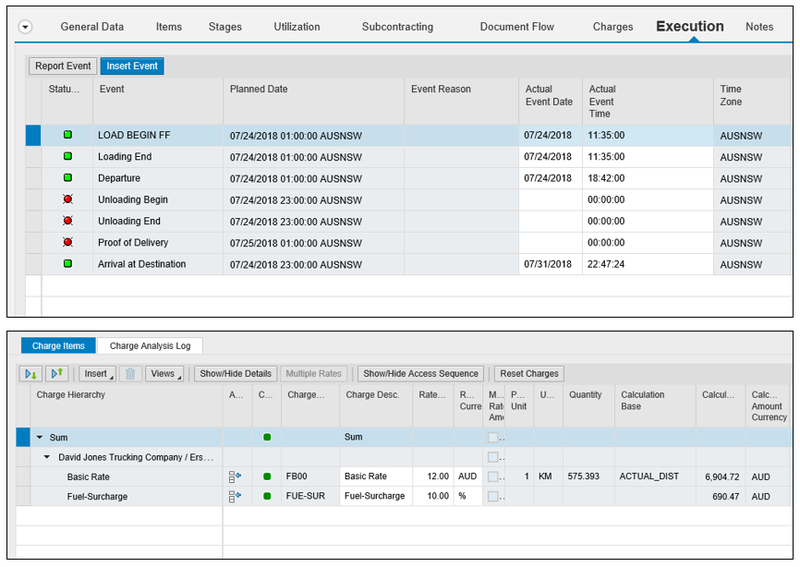 Specific event and flat charges: In this scenario, the carrier charges an additional amount if a specific event occurs. For example, carrier may charge for cleaning, destination charges, fumigation etc… A flat rate is usually charged and the same can be maintained against the charge type in the freight agreement. Above screen shots detail a working model for cleaning event scenario. 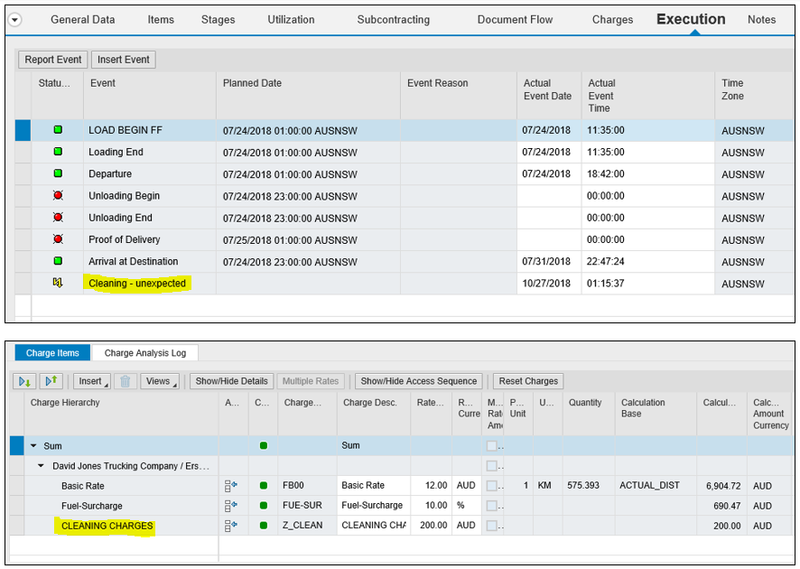 Event with an input: In this scenario, the carrier reports duration/additional amount as a part of an event and the charges are applied accordingly. Here, we don’t calculate the delay/time based on actual and expected events. We assume that carriers have correctly calculated the duration/additional amount and hence we need not worry too much about the accuracy of expected and reported events. There is no standard calculation base available to receive the duration/amount during an event posting. Hence, we may require some additional coding to receive these input, either as an event reason code or some other custom field. However, there is a work around. We can create multiple events or event reason codes if these inputs are finite/limited. For example, we can create ‘L4D1- less than 4-hour delay’ event and ‘M4D1 -more than 4-hour delay’ event and maintain respective charges for each charge types. Hence, when L4D1 event is posted, then the charges/charge type for less than 4-hour delay is activated. Whereas when M4D1 event is posted, then the charges/charge type for more than 4-hour delay is applied. If the business requirement is complex and there are more scenarios, then it is advisable to have an enhancement to cater to the precise requirements. The are other requirements in event driven charge calculation, which may require some additional coding. But above 3 scenarios cover most of the requirements in the transportation process. Also, since the technical framework is in place, the required coding is usually less and is mostly in the helper class of calculation base. Entire freight settlement process can be automated via SAP Batch jobs and manual intervention is usually required only for dispute. Dispute within a tolerance range can be designed to be auto approved. With event driven charge calculation functionality, scenarios with charge differences (more than the tolerance limit) between Carrier Invoice and TM FSD can be significantly reduced. This significantly improves the total automation of freight settlement process with the carriers and reduces the invoice verification cost. These advanced functionalities are not available in LE-TRA. Hence, this is clubbed as professional shipping functionality, which requires additional license cost. There are many other advanced features in this area which are available only as part of professional shipping functionality. For example, freight agreement determination condition, DIM weight based charge calculation, integration to Logistics Business Network (LBN), dispute resolution process (From 1809 onwards), forwarding settlement process for LSP scenarios (with and without event driven charge calculation) etc… These additional functionalities have significant business impact and hence professional shipping in S/4 HANA supply chain for TM (embedded TM) is a good business case for various customers with high freight spend.